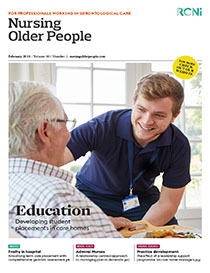 If high-quality, person-centred care is to be provided for older people with complex needs, it is essential that nurse education should aim to extend students’ knowledge and skills in longterm care, and integrated health and social care. Northumbria University, local care homes and NHS organisations have collaborated to develop integrated, cross-sector practice placements that support this learning for nursing students. While there have been challenges in developing these placements, initial feedback is positive, suggesting the placements promote improved interorganisational working and learning for staff as well as students.